We're in a colorful state of mind and wanted to share this artistic vignette for today's inspiration! It's as if a beautiful painted canvas had transformed into a tablescape. The table runner has such a unique indie pattern and those flowers are just plain gorgeous, so colorful with such fun textures! The plate setting is perfectly simple against such a vibrant backdrop. What are your thoughts on this tablescape? Let's hit the beach, shall we?? While it's still a bit chilly out here in New York, we know it's warm and sunny elsewhere! We're loving the bold and bright colors! Oh, and those sea fans are STUNNING. We adore that how they're used as the backdrop for each plate setting ... super lovely! The greens and blooms create so much texture and color, so vibrant and perfect for a tropical soirée! Would you want to have a beach wedding?? With it still being cold in New York, we're daydreaming of warmer weather and the beach! We love this setting -- such a fun mixture of billy buttons, hydrangeas, scabiosa pods, and pink spray roses. And those palm leaves? Amazing, we adore the drama. Isn't it lovely?? 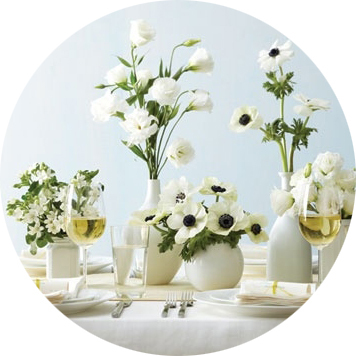 Trust us when we say that white tablescapes are anything but boring! Take a look at this beautiful setting. The mix of ivory and white as well as the splashes of green give off a sweet natural look & feel. We adore the varying types of flowers for a fun mix of texture and height -- really makes your eye want to look at every detail! Together, it's simple, classy and just plain gorgeous. We came across this whimsical pink + yellow tablescape and our hearts skipped a beat. Sophisticated yet playful, so perfect for an intimate brunch gathering! We fancy the mix of polka dots, scallops and stripes! In using the same color hues, layering patterns can be so much fun and give such a bold look. The eucalyptus branches add height to the vignette and those dual-tone roses in milk bottles are just too darn cute. Oh, Spring ... we know you're just around the corner! Oh goodness, twelve more days til Christmas! With family visiting soon, I'm excited to have thrift finds to use as holiday décor around the abode. You can never go wrong with gold! These two vessels are the perfect containers to hold festive flowers. We wanted to be fun and non-traditional so went with a mix of pink, green and gold as our color story for the holidays. These babies were only a whopping $5 a pop -- great quality and super elegant, just what I was looking for!